I like to describe myself as a "recovering journalist." As the author of six books, I feel I am half-way through the twelve-step program to regain full sanity. My focus has shifted from the "first rough draft of history" to the second. Now an American citizen, I was born in Belfast, Northern Ireland. I was a child of the Cold War--almost literally. I went to Russia for the first time at the age of six weeks, courtesy of my diplomat parents. I experienced every Soviet leader, from Stalin onwards. Here I am above, aged seven, with my mother and younger brother Geoffrey, in the British embassy, opposite the Kremlin, under the watchful eye of a KGB guard. This was during the Khrushchev "Thaw." In one way or another, I have been thinking--and writing--about the Cold War ever since, with occasional forays into World War II and the Holocaust. I spent much of my journalistic career covering the collapse of communism. After a stint in Rome as a correspondent for Reuters, and a tour of Africa, I lived in Yugoslavia during the twilight years of Marshal Tito. In 1980, Tito died, and I moved to Poland for The Washington Post, just in time to witness the extraordinary spectacle of workers rebelling against the "workers' state." I was the first western reporter to visit the Lenin shipyard in Gdansk in August 1980 and was standing in front of Boris Yeltsin when he climbed on a tank in August 1991 to face down Communist hardliners. (See photograph below.) In between, I reported on the imposition of martial law in Poland, the Chernobyl nuclear catastrophe, Gorbachev-Reagan summits, the Tiananmen uprising in China, and the 1989 revolution in Romania. 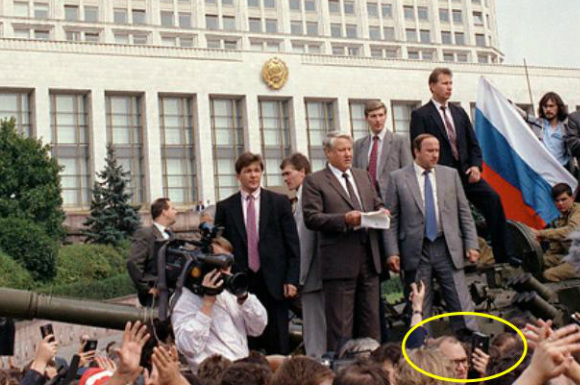 Michael, circled, reporting on the August 1991 coup. Other highlights of my journalistic career included exposing the Soviet atomic spy known as Mlad (Theodore Hall), revealing Madeleine Albright's links to the Holocaust, and covering the Bosnia peace negotiations as the diplomatic reporter for The Post. For a change of pace, I was swimming off the southern tip of Sri Lanka in December 2004 when I was almost swept away by the monster tsunami. In 2007, I launched The Post's Fact Checker column, handing out "Pinocchios" to lying politicians. Since retiring from The Post after the 2008 election, I have focused on researching, writing, and teaching. I have taught courses at the universities of Princeton, Michigan, and Georgetown, as well as American University. I have been on the staff of the United States Holocaust Memorial Museum since 2013. I organized conferences of international decision-makers on the genocides in Rwanda and Bosnia, and helped research the Museum's "Americans and the Holocaust" exhibition. The Unwanted is my sixth book. The Rise of Political Fact-Checking: an essay on the fact-checking revolution in American journalism. "Why I write": Essay for Publishers' Weekly. Thoughts on the collapse of communism and the fall of the Soviet Union, twenty years later.